Our Street Trucks have a slacker geometry than most other regular skate trucks out there, making them more suitable for higher speeds and those who prefer more lean. Taller bushings give a deeper turn. Click here to learn more. Heat Treament adds around 30% extra tensile strength to cast or forged aluminium. We use the a process to the T-6 standard for best results. During our last round of lab testing it was extremely obvious which truck brands heat-treat their trucks, and which don’t. Non-heat treated trucks shatter under impact, whereas heat treated parts tended to survive a lot better, bending and then finally shearing. 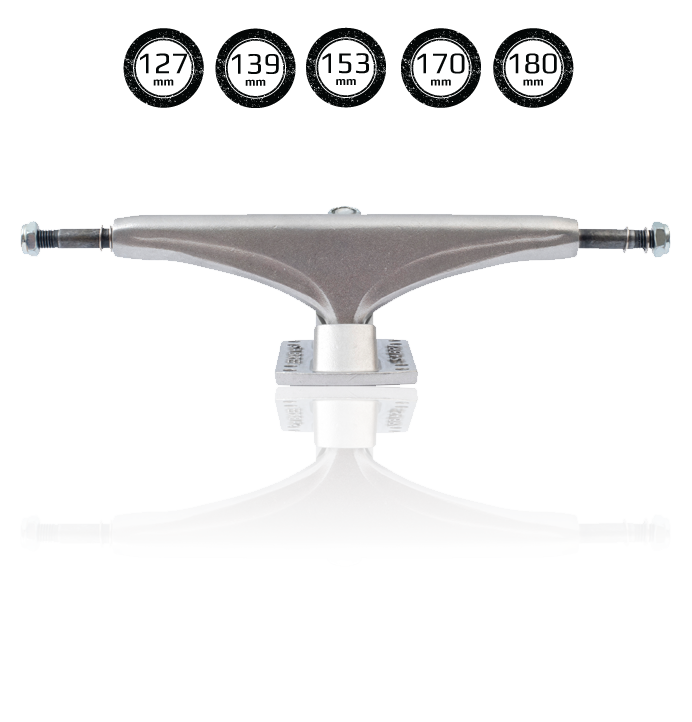 As skaters, we prefer trucks that fail in a controlled manner to trucks that shear and shatter in a so called “catastrophic” manner. When you buy our trucks you can be assured that we are one of the manufacturers that do heat treat our cast and forged trucks, and we take pride in our use of this process to make sure that your trucks are as strong as we can make them. Our Forged Precision Hangers feature true 8mm axle studs for a precise bearing fit. Click here to learn more! 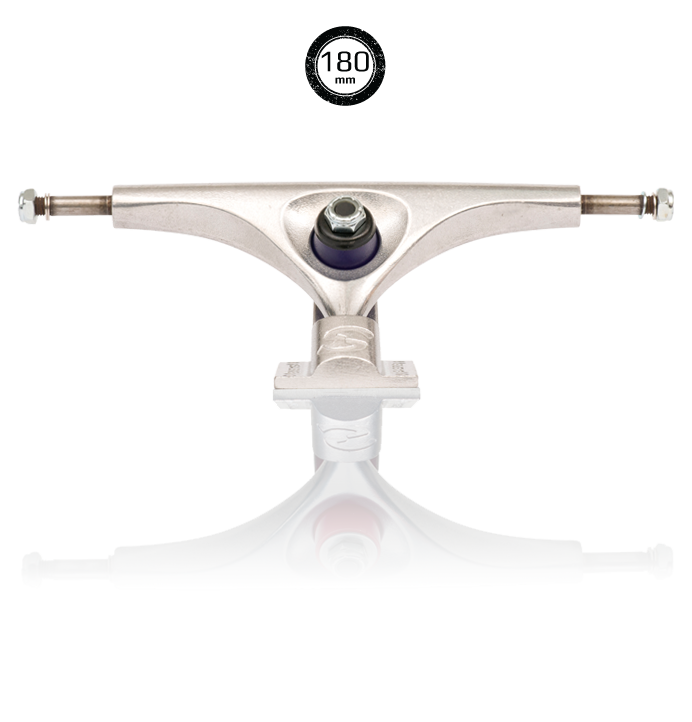 Grade Eight Hollow Kingpins and Japanese Steel Axles make our Hollowlite Trucks about 30g lighter per truck than their regular Standard counterparts with no consequential impact on strength. Click here to learn more! Grade Eight Hollow Kingpins save a few grams per truck with no measurable impact on kingpin shear strength. Why carry weight you don’t need? We use true Gravity Casting in permanent steel moulds. This allows the use of much better grade aluminium than other, cheaper “die cast” trucks, which produces a significantly stronger truck. The bench testing we have done suggests that the Sabre Gravity Cast Hangers are among the stiffest and strongest cast hangers on the market. Click here to learn more! Our Forged Precision Trucks and Hangers are made with a post-forging CNC operation on the pivot to ensure perfect concentricity. These trucks have almost no slop and feature a very smooth turn. We’re all about using cool high-tech production processes to create trucks that feel amazing – click here to learn more! Cold Forging is the best way of getting Maximum Strength from the original material. By hammering hangers and baseplates out of raw 6061 billet, we are able to create a much lighter, stronger truck. Click here for more info on our Cold Forging process, why it works and what it means for your trucks.